Dorothy Moore is not only a Lemon Bay teacher, she is an alumnus. She attended from grades seven through twelve. 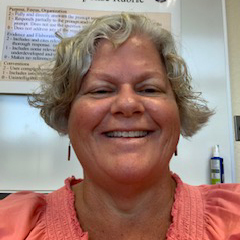 Ms. Moore is a member of the second class to graduate from Lemon Bay in 1982.Blackburn University, in Carlinville, IL, is where Ms. Moore went and played on their collegiate volleyball, basketball and softball teams for three years. She transferred to The University of Florida to earn her Bachelors and Masters Degrees in Education. After graduating, she returned to the Englewood community. She taught at L.A. Ainger Middle School for 10 years before moving over to Lemon Bay. This is her 21st year at The Bay. While Moore enjoys her time at school, she finds plenty of things to do outside of school. She enjoys taking part in all kinds of outdoors activities. When Moore finds time at home, she likes to cozy up to a good book.Moore loves being heavily involved in all of the school activities. She wants to give back what Lemon Bay gave her. "I will do anything for my students; even if I have to pull it out of a hat, just as long as they understand; that is all that matters." My goal is to see all of my seniors walk across that stage to receive their standard diploma. When you see her in the halls, ask her how her day is. You are almost guaranteed to hear: Every day is a GREAT DAY at THE BAY!!!"